The adorable endless runner, Baby Monkey (going backwards on a pig) by @KihonGames, recently got a new update. To celebrate, we’re giving away five promo codes to five lucky people! 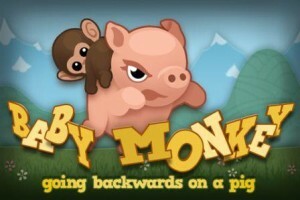 The first is hidden in our Baby Monkey review. 1. Make sure you’re following @AppUnwrapper on Twitter. You can also “Like” our Facebook page for an extra entry. The contest will end on Sunday, April 22, 2012 and the codes are for iPhone/iPod. Please make sure to use the codes ASAP, as they do expire. Previous PostGiveaway: Win a Demons Land Promo Code! Next PostGiveaway: Win a FREE copy of “The Secret of Arcanesium”!